When you run one of your generators do your L.E.D. indicator lights twinkle? Do your digital read outs jump around or other types of lights flicker? Or maybe the zinc anodes on your hull and pipes are going away very quickly near one of your gen. sets. These are all possible signs that your generator is shocking the boat. Before you call the cavalry for another expensive house call, why not pull a cover off of your generator and inspect the wiring for some easy to spot issues that could be your trouble. Before we start, turn the engine off and ensure that all breakers to the generator are in the off position. 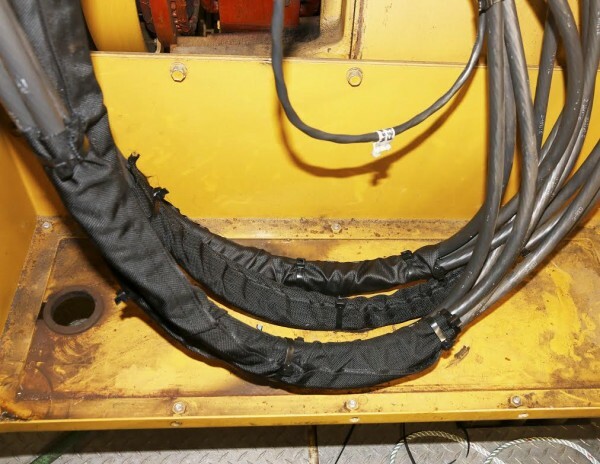 Since the field wires of all generators have some residual voltage that is needed to build up the magnetic field I do not recommend disconnecting any wires unless you know how to, “Flash the field,” of the generator to help it build magnetism after it’s circuits have been disconnected. Avoid handling the connections and touching the terminals where the wires connect (This is just good practice and should be a rule with all electrical devices that you do not have a complete understanding of) there may be corrective capacitors or some live circuits (Like heaters and stuff) that can shock you. For what we are doing touching the terminals is not necessary. Once the panels are removed you can see that this is a very clean generator. 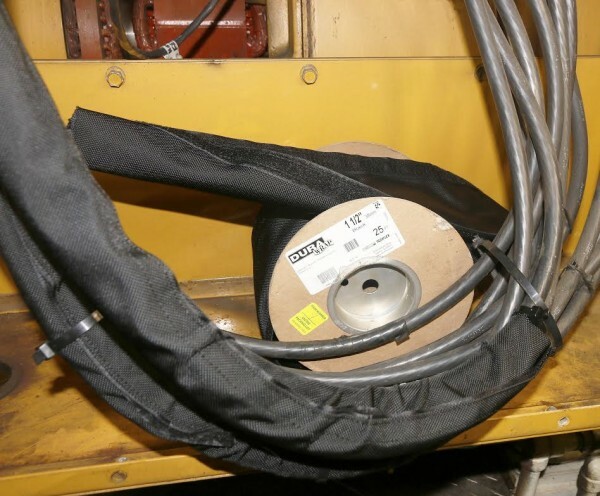 The wires have an extremely high quality and very durable outer jacket. At first glance you wouldn’t suspect there would be anything wrong here. After moving the wires aside it is easy to see why this generator is causing electrolysis. 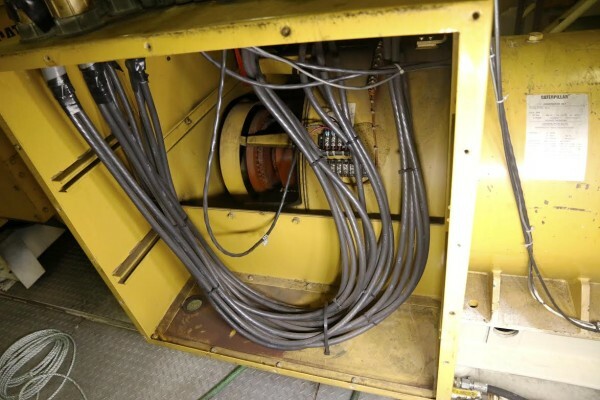 The wires have chafed right into the bottom panel of the generator and you cans see where some arcing has occurred. No good. From this angle it is clear how deep the wires have gouged the generator cover. This was going to become a big problem very soon. Here are the items I will be using to solve these problems. I use fast curing 5200 for holes in the jacket. 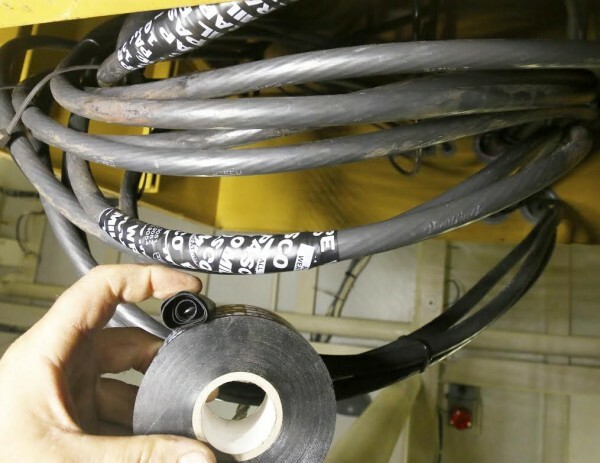 Wrapping the wire with rubber splicing tape increases its resistance to arcing and current flow leaking through and causing electrolysis. I use the large 10mm vinyl tape (Pipe Wrap) to add both resistance to arcing and chafing to the wire (over the rubber splicing tape). Yes my black tape is way bigger than yours, but we aren’t wiring a light for your girl friend’s back porch. This is a 1000 horse power generator that produces 480 volt power. For that you need industrial sized tape. Using a giant roll of tape isn’t practical when attempting to wrap wires that are close together. 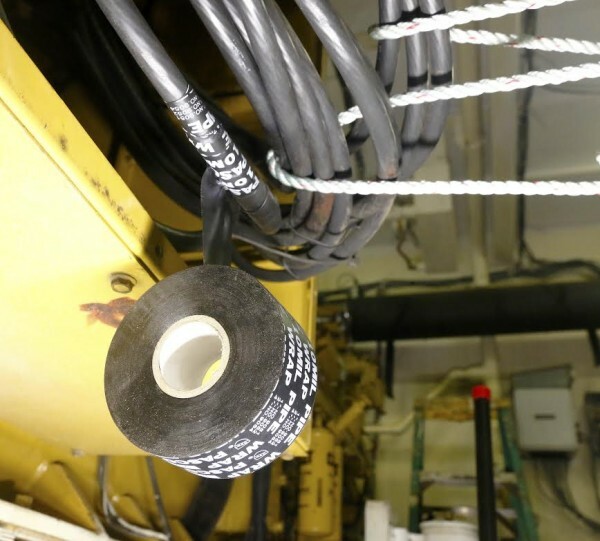 By rolling the tape up backwards into a small roll like the one under my finger you can easily wrap wires that are bundled together quite tightly. Here the wires are repaired and sufficient chafing gear installed. The generator is ready to test to ensure that there is no other issues causing electrolysis. The generator is working perfectly and all signs of electrolysis are gone. 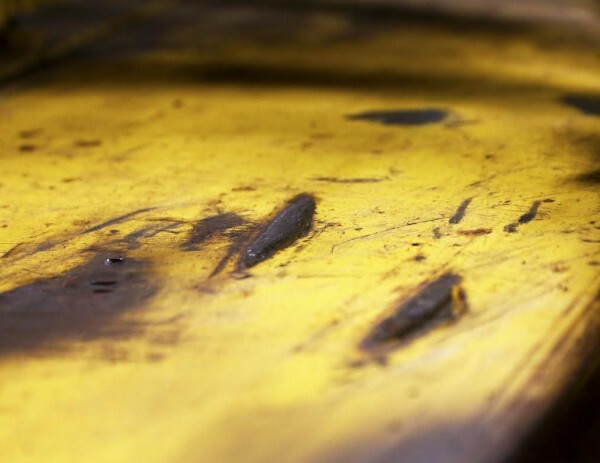 The only thing left to do is take a swim under the boat and see how much wear the zinc anodes have been subjected to while protecting the hull of the vessel from this incident. That is for another article. Thank you for reading and I will of course answer any question left in the comments. 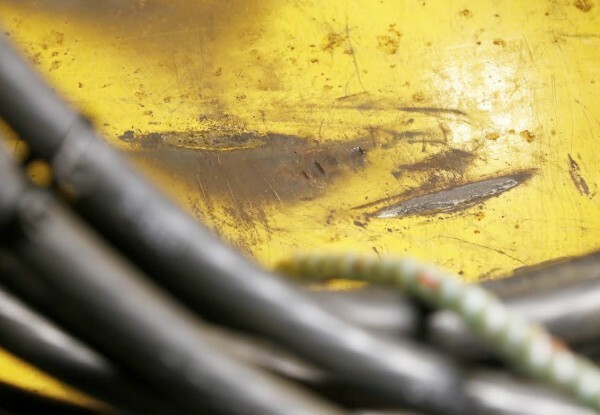 When working around electricity and electrical connections please take precautions to protect yourself at all times. 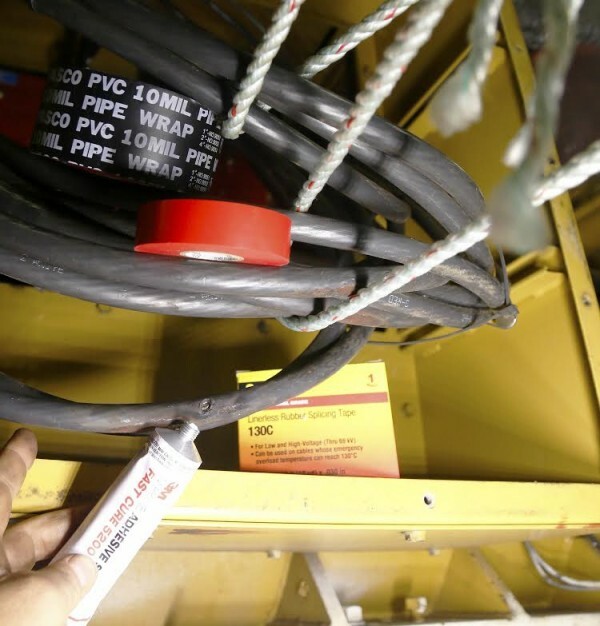 Remove all sources of power from any electrical equipment before removing protective panels. 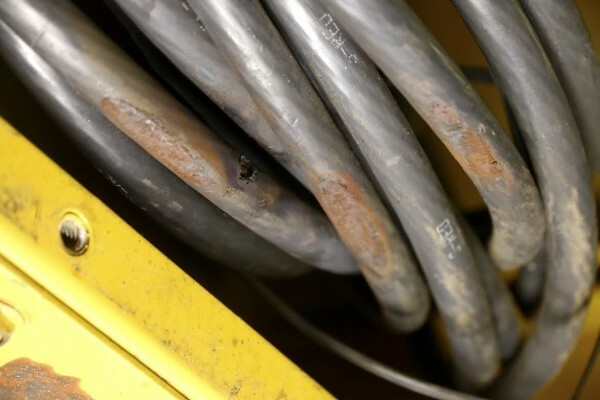 Never touch terminals or bare (copper exposed) wires unless you are certain that they are not energized. Lock out circuit breakers and leave signs so that no one energizes equipment you are working on. Do not touch terminals or bare wires unless it is entirely necessary and then as little as possible. Wear good rubber sole shoes.